Startupticker.ch published their annual Swiss Venture Capital Report in collaboration with the Swiss Private Equity and Corporate Finance Association (SECA). The editor-in-chief Stefan Kyora wrote in his letter from the editor that “Switzerland has come a step closer to this vision of a functioning startup and venture capital industry.” His statement is bolstered by the fact that it was a record-breaking year for the country; the total of reported investments went up from CHF 300 million in 2012 to CHF 938 million. Furthermore, the report pointed out a rising median and a higher number of growth financings of between CHF 2 million and CHF 10 million. Although Swiss companies still currently rely on foreign investors to achieve global notoriety, this sharp increase in participation is a promising sign for Swiss venture capitalism. This spike in investment also coincides with recent efforts to establish a support system in the country for startups, like the Swiss Future Fund and the Swiss Entrepreneurs Foundation. 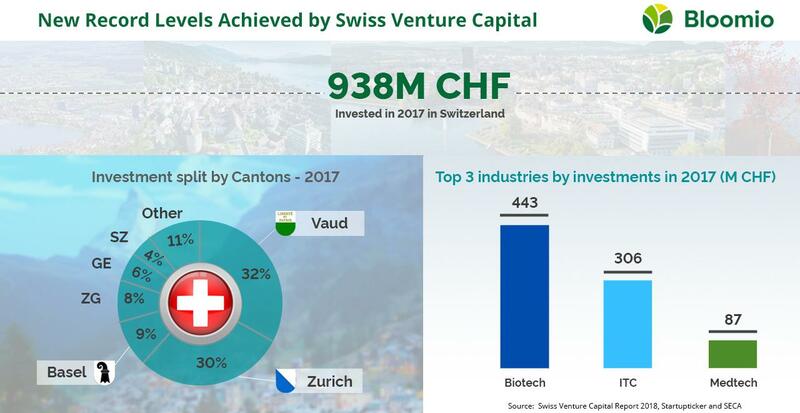 Other examples of impressive growth in the Swiss venture capitalism arena are the biotech, fintech, and ICT sectors. Every year, the trend of increasing investment into biotech continues. This trend was also mirrored in the fintech sector, which experienced a 61.8 percent increase in investments, totaling at CHF 75.7 million. Both of these increases cannot even compare to that of the ICT sector, which is now ranked alongside biotech. This means that not only is the Swiss venture capital market growing in terms of invested capital, but also in sector diversity as well. However, regarding number of rounds, fintech took the lead for most increase. The amount of investment rounds in fintech doubled between 2016 and 2017, and is continuing to rise still. When taking into account both fintech and ICT together, the sectors experienced a 12 percent increase in rounds. Additionally, capital availability in ICT by over CHF 1.1 million. This is thanks to fintech startups, which on average collected CHF 3.5 million per round in 2017. Even early stage financing increased in the ICT (which includes fintech) and biotech sectors. There is a certain kind of symbiosis that is currently occurring in Switzerland, which is allowing for the extreme growth of venture capitalism across industries. Instead of inciting cutthroat and dangerous competition, the sectors are working together to create a unique Swiss ecosystem unlike anything the country has seen before—as exemplified by the aforementioned increase of ICT capital availability as a result of investment in fintech. Another example of a changing Switzerland is the fact that capital availability in the area of growth capital and follow-up rounds of financing has never been higher. A historically scarce area in Swiss finance, 2017 brought in a positive development; in fact, 40 percent of transactions actually took place in this area. All of this good news does not mean there is no room for improvement, though. Rather, the situation is quite the opposite in Switzerland. Young venture capital funds are entering the market and shaking up traditions, raising more money than before and offering what startupticker.ch reporter Thomas Heimann calls “a very welcome development for the continued growth of the Swiss ecosystem.” The seizure of opportunity in Switzerland by young funds shows the exact type of ambition that venture capitalism needs in order to succeed. The Swiss Venture Capital Report proves that this year shows the dawning of a new era in Switzerland. Participation in venture capitalism is at an all time high in the nation, and people are noticing. Corporate venture capitalism is also on the rise, making use of a transitional time in order to innovate. These are the beginnings of corporate venturing. Digital crowdfunding is also finally becoming a valid investment practice. It’s an exciting time to be a venture capitalist in Switzerland, without a doubt.